The Spanish Civil War started in July 1936. It was between the leftist Republicans, who were in government at the time, and the Nationalists. The right wing Nationalists were led by the army and had the support of the Catholic Church, monarchists and large landowners. There were a number of issues that directly led to the outbreak of the Spanish Civil War. The greatest of these was the long period of decline that Spain had suffered since the days of the Spanish Empire. By 1930 Spain had lost all of her empire and was lagging behind the rest of Europe industrially. The monarchy was overthrown and the Second Empire formed in 1930. This government proved to be completely inept at carrying out reforms and maintaining law and order. Divisions continued to widen between the towns and the countryside and the wealthy landowners and peasants. Many areas of the country wanted to have their own government and wanted independence from the rest of Spain. The Church was one of the most powerful forces in the country and it was strongly opposed to social reform therefore it was vehemently opposed to the Republican government. The army had always had a history of meddling in the country’s politics. The senior commanders were constantly worried about the amount of influence that Communists had in the government and were concerned that there might eventually be a Communist takeover. Violence had always been an inherent part of all attempts at democratic elections. Quite often the genuine results were altered due to intimidation and other tactics. Spain was quite literally ready to explode and the final spark that lit the fuse of war was the assassination of the right wing leader, Calvo Sotelo, in July 1936. The war itself was extremely horrific. There was a considerable amount of interference from other countries mainly because the war was a fight between the left and right factions. The fascist governments of Germany and Italy gave their support to the Nationalists under General Franco. Up until the outbreak of the war Franco had amassed his troops in Morocco. They were unable to cross back into Spain until Hitler and Mussolini provided airlifts. This began the forward push of Franco and ultimately led to his success. Although the USSR gave its support to the Republican government there was no other official aid from other countries. However, a number of International Brigades and foreign volunteers did join forces with the Republicans. 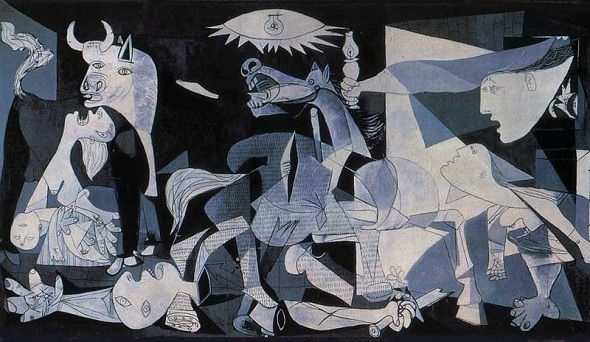 The Spanish Civil War has often been seen as a prelude to the Second World War. Indeed there were a lot of tactics that were adopted that became widespread during WWII. For example, it was the first war where air power played a significant part and this included bombing of towns and other civilian targets. Armored vehicles were used in formation to drive the enemy back. Propaganda was also widely used against the Republican supporters which broke a lot of their resolve. One of the main reasons General Franco and the Nationalists were victorious after three years of war was that the army was on their side. The Republicans did manage to train their own troops and they had become a good fighting force by the end of the conflict but it was not enough against the professional soldiers. There were some soldiers who defected from the army and went to fight for the Republicans but they were often suspected of being spies for the Nationalists and their expertise was not made use of. General Franco had taken all of the various Nationalist groups and unified them into a far stronger force than the Republicans. He also had far more support from other countries than the Nationalists did. Germany and Italy provided troops and equipment throughout the war. After the war ended Spain suffered under the 40 years of Franco’s rule. They were diplomatically isolated from other countries and the country itself was in turmoil. There had been a huge loss of life and damage to the infrastructure. Franco was in complete control and the government revolved around him. Censorship was introduced and the regionalism that had been brewing before the war was completely outlawed. Industrially Spain suffered extensively too. It had been struggling before the war and now it fell even further behind its European neighbours. The majority of the damage that the war had caused could not be repaired as there simply wasn’t the money. The country had very little money because the Republicans had sent all of the gold reserves to the USSR for safe-keeping and now Germany wanted reparations for the help that it gave Franco that enabled him to seize power. Democracy would not return to Spain for more than four decades. This article is not correct. Franco was a strong authoritarian ruler, but he brought prosperity to Spain. The economy in Spain flourished under his leadership and the unemployment was one of the lowest in Europe during his time in power – Spain became an industrialized nation under Franco’s dictatorship. It was, partly, because of their good economical showing that Spain was in position to peacefully transition to a democratic state after Franco died. Franco’s biggest problem was not being able to unify Spain – he tried that by using force; hence the constant problems in Catalonia and the Basque regions. Please research Spain’s history further and fix the problems with the essay. The essay is quite accurate. Spain was isolated from the rest of Europe and lagged behind the rest of the world under Franco’s rule. Sure, its economy improved but basically every Western country’s economy improved after WWII. After Franco’s death, Juan Carlos was the one who modernized Spain and brought it up to speed with the rest of the world. The essay is not correct. If you get properly informed about the employment and GDP growth rates during Franco ruling you will see that, despite the isolation that Spain suffered during some time -not all Franco’s rule received isolation-, its economy and industrial sector grew at considerable levels, probably as good as many other European countries after WWII. It is true that under Franco dictatorship there was censorship and there was no democracy, but the alternative in the war would have been a communist/anarchist lead country far worst in every field than Franco dictatorship. Most foreigners tend to wrongly think that the alternative to dictatorship was democracy and freedom, but that is absolutely wrong. The International Brigades that came to fight in Spain on behalf of the republican side, were not probably well informed that they were supporting the communist. The USSR and their expansionist communism system wanted to have in Spain a satellite as a kind of a prelude of the iron curtain that delivers throughout eastern Europe some few years afterwards. The badly known “Republicans” should be called “The Communist” as it describe better what they pretended to do and impose in Spain. Spanish development started with Franco dictatorship. Most of the largest infrastructures including roads, water reservoirs, hydroelectric dam, and advanced, fair and efficient administrative laws were built and brought to operation bringing quality and justice to the public service. I do not want to undervalue any importance to the Spanish democracy and the members who made it happened since Franco dead in 1975 until the Constitution was enacted in 1978, but I dare to say that thanks to Franco era, the considerable wealth generated during his ruling, a new middle class was created that allowed the transition from dictatorship to democracy without starting a new war or avoiding any bloodshed. This is clearly the great success of Franco, together with avoiding the Spaniards to be ruled by the USSR Stalin style communist government, and once the war was won, avoiding to enter into WWII, as well as modernising and constructing the foundations of the new Spain. Don’t you think this is a cumulus of great successive success as outcome of Franco’s dictatorship government that Spain went through during almost 40y? Spain is an Arab country, a Christian one but still Arabian by race.